(Vatican Radio) Pope Francis was back in St Peter’s Square for the traditional recitation of the Angelus on Sunday following his return from a journey to Myanmar and Bangladesh. From the window of his studio the Holy Father thanked all those who accompanied him there in prayer. He told all those gathered in the square that he was impressed by the many noble and smiling faces he witnessed despite their hardships and he expressed his closeness to them. (Vatican Radio) Pope Francis on Monday released his message for the 2018 World Day of Prayer for Vocations, reflecting on the three aspects of every vocation: listening, discerning, and living. The 55th recurrence of the Day for Vocations is to be commemorated next year on 22 April. Listening, discerning, and living: these lie at the heart of Pope Francis’ message for next year’s World Day of Prayer for Vocations. The Holy Father said 2018 is a special year for vocations, because the Synod of Bishops will reflect on young people, especially “the relationship between young people, faith, and vocation”. Pope Francis reminded Christians that God never ceases to call men and women to follow Him. "Let us keep in mind our elders, so that sustained by families and institutions, may with their wisdom and experience collaborate in the education of new generations." It has become the custom of Pope Francis to release a video message detailing his new prayer intention each month. The monthly videos are promoted by the “Worldwide Prayer Network of the Apostleship of Prayer,” an organisation dedicated to spreading the Pope’s prayer intentions concerning the challenges facing humanity. Rome, December 4, 2017 (LifeSiteNews) – Retired Catholic Bishop of Corpus Christi TX, Rene Henry Gracida said on his blog over the weekend, “Francis’ heterodoxy is now official.” England’s internet-famed Deacon Nick Donnelly wondered on Twitter, “Has Francis deposed himself as the successor of St Peter by attempting to make the heretical interpretation of AL Authentic Magisterium?" The comments come in response to Pope Francis' elevation of a controversial private letter of his to the status of an 'apostolic letter' and calling it "authentic Magisterium." His private letter to the Argentine bishops approving their guidelines for giving communion to civilly-divorced-and-remarried Catholics living in adultery was originally thought to be fake news because of its departure from Catholic teaching. But, it was later confirmed. Last week the controversial letter was published officially by the Vatican in an elevated status as part of the Acta Apostolicae Sedis, or Acts of the Holy See, at the request of the Pope. Radio Spada, the Italian media outlet which broke the story, posted photographs of the newly published Acta Apostolicae Sedis (AAS) for October 2016 on its Facebook page. The photographs show that Pope Francis’ private letter telling the Argentine bishops that “there is no other interpretation” of Amoris Laetitia (AL) beyond their guidelines has been published in the official register of the Roman Catholic Church. “The Supreme Pontiff decreed that the two proceeding documents be promulgated through publication on the Vatican website and in Acta Apostolicae Sedis, as authentic Magisterium." In the life of a Christian, humility is an indispensable quality that is needed in order to allow the gifts of the Holy Spirit to grow. This was the reflection of Pope Francis in his homily at Mass, Tuesday morning, in the chapel of the Casa Santa Marta residence in the Vatican. Drawing inspiration from the Prophet Isaiah, the Pope said that every Christian is like "a small shoot on which the Spirit of the Lord rests, the spirit of wisdom and intelligence, the spirit of counsel and fortitude, the spirit of knowledge and the fear of the Lord ". "These,” the Pope said, “are the gifts of the Holy Spirit which grow from the smallness of the bud to the fullness of the Spirit. This is the promise, this is the Kingdom of God” and "the life of the Christian," he stressed. The Pope said that the task of a Christian is to be aware that each of us is a “sprout of that root which must grow with the power of the Holy Spirit, to the fullness of the Holy Spirit in us.” And our task, he said is to safeguard this sprout, this growth which is the Spirit." The Holy Father said this is done by adopting a lifestyle of a Christian that resembles Christ, which is the path of humility. WASHINGTON (CNS) -- Pope Francis has named Washington Auxiliary Bishop Barry C. Knestout, 55, as the 13th bishop of Richmond, Virginia. He succeeds Bishop Francis X. DiLorenzo, who was Richmond's bishop from 2004 until his death in August at age 75. The appointment was announced in Washington Dec. 5 by Archbishop Christophe Pierre, apostolic nuncio to the United States. Bishop Knestout's installation Mass will be celebrated Jan. 12 at the Cathedral of the Sacred Heart in Richmond. (Vatican Radio) Pope Francis before his General Audience on Wednesday, greeted a Palestinian delegation hosted by the Pontifical Council for Interreligious Dialogue. (Vatican Radio) Pope Francis on Wednesday reflected on his just-ended apostolic journey to Myanmar and Bangladesh highlighting the value of interreligious dialogue undertaken in the first leg of the journey, and expressing solidarity with Bangladesh’s efforts to provide relief to the Rohingya refugees flooding into the nation during the second leg of his visit. The Pope was addressing pilgrims gathered in the Paul VI Hall for the weekly General Audience. Interrupting briefly his series of catechetical reflections on the Sacraments, Pope Francis told those present that he wished to speak of the apostolic journey that took him to Myanmar and Bangladesh in the past days describing it as a great gift from God. Noting that for the first time ever the successor of Peter was able to set foot on Myanmar soil, he spoke of witnessing a nation that is gradually moving towards a new experience of freedom and peace. The Pope’s Greetings to Visitors form Jordan, the Holy Land, and the Middle East. (Vatican Radio) Pope Francis has appealed for respect for Jerusalem’s status quo according to the pertinent United Nations Resolutions regarding the city. Speaking after his catechesis to the crowds in the Paul VI Hall during the weekly General Audience, the Pope said “my thoughts go to Jerusalem and I cannot keep silent my deep concern for the situation that has been created in the past days”. “At the same time, he continued, I would like to make a heartfelt appeal for everyone’s commitment to respect the city’s status quo, in conformity with the pertinent United Nations Resolutions”. The Pope’s words of concern came on Wednesday ahead of an expected announcement by US President Trump to recognize Jerusalem as Israel’s capital. Arab leaders have warned the move will create turmoil and trigger violence. Describing Jerusalem as unique city which is “Holy for Jews, Christians and Muslims, who venerate the Holy Sites of their respective religions”, the Pope said it has a special vocation for peace. “I pray to the Lord that its identity is preserved and strengthened for the benefit of the Holy Land, the Middle East and the whole world and that wisdom and prudence prevail to prevent new elements of tension from being added to a global context already convulsed by so many cruel conflicts” he said. Vatican City, Dec 6, 2017 / 10:08 am (CNA/EWTN News).- In a message to the Pontifical Academies on Tuesday, Pope Francis praised the study of Latin, especially for young people, and encouraged scholars and teachers to promote its study as a positive guide for students as they navigate life. (Vatican Radio) Pope Francis met on Thursday with the new president of the Lutheran World Federation, Nigerian Archbishop Musa Panti Filibus, focusing on common prayer as the key to Christian unity. Recalling his own visit to the Swedish cities of Lund and Malmo last year for the shared commemoration of the 500th anniversary of the Reformation, the pope said praying together purifies, strengthens and lights our way forward. Prayer, he insisted, is the fuel for our ecumenical journey. Through prayer, the pope continued, we are able to see the painful divisions of past ceneturies in a new light, abandoning our prejudices, purifying our memories and looking to the future with confidence. Through prayer, he said, we are called to recognize the gifts of our different traditions and receive them as our shared Christian heritage. In his words to Pope Francis, Archbishop Musa also gave thanks for the past 50 years of progress ‘from conflict to communion’, acknowledging in a special way the importance of praying together to commemorate the Reformation anniversary. (Vatican Radio) Pope Francis has urged members of the National Council of Churches of Taiwan to continue in their work to educate young generations “in the art of dialogue, so that they can become protagonists of a much-needed culture of harmony and reconciliation”. The Pope was addressing a Delegation of the Council whom he received in audience in the Vatican. The ecumenical Council, founded in 1991, aims to achieve full Christian unity by strengthening the relationship of churches, promoting cooperation, charitable works and education as well as proclaiming the Christian message, and participating in the common mission of the church to the world. 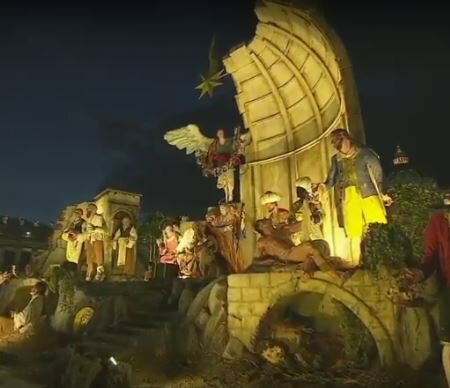 Pope Francis on December 7, 2017, thanked those who donated the Christmas Tree and Nativity Display in St. Peter’s Square. He received in Paul VI Hall the Delegations from Poland and the Abbey of Montevergine. It is a joy for me to welcome you in this circumstance, and to address to you my thanks for the gift of the nativity display and the Christmas tree in Saint Peter’s Square. I offer a heartfelt greeting to you all, starting with the authorities and representatives of the Institutions that organized this initiative. I greet the Abbot of Montevergine, for the gift of the Nativity display; the archbishop of Warmia and the bishop of Elk in Poland, from where the tree comes, with the Directorate of Bialystok State Forests. In addition, I greet the children treated in the oncological wards of various Italian hospitals and in the areas of Central Italy affected by earthquakes, coordinated by the “Contessa Lele Thun” Foundation, who made the decorations. 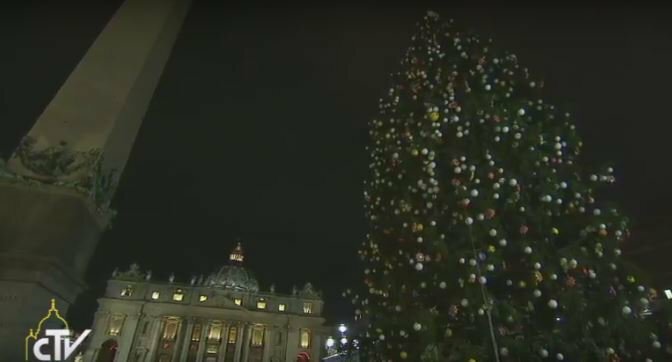 #PopeFrancis: A Christmas tree is reminder of "how beautiful and joyful it is to be immersed in the light of Christ"
Vatican Christmas. First they light the Nativity scene. VATICAN CITY, DECEMBER 8, 2017 (Zenit.org).- Here is a ZENIT translation of the address Pope Francis gave today before and after praying the midday Angelus with those gathered in St. Peter’s Square. Today we contemplate the beauty of Mary Immaculate. The Gospel, which narrates the Annunciation, helps us to understand what we are celebrating, especially through the greeting of the Angel. He addresses Mary with a word that is not easy to translate, which means “filled with grace,” “created by grace,” “full of grace” (Luke 1:28). Before calling her Mary, he calls her full of grace, and he thus reveals the new name that God has given her, which fits her more than the name given to her by her parents. We also call her thus, with every Hail Mary. This afternoon I will go to Piazza di Spagna to renew the traditional act of homage and prayer at the feet of the monument of the Immaculate. I ask that you join me spiritually in this gesture, which expresses our filial devotion to our heavenly Mother – all together, with the spirit, before Our Lady. I wish you all a happy feast and a good Advent journey. Please, don’t forget to pray for me. Have a good lunch and goodbye! (Vatican Radio) Pope Francis left the Vatican on Friday afternoon, headed for Rome’s central Piazza di Spagna in order to pay homage to the statue of the Immaculate Conception there. Surrounded by crowds of pilgrims, tourists and local Roman residents, the Pope recited a specially-composed Prayer to Our Lady in which he asked her, among other things, to help us “rid ourselves of all pride and arrogance and to recognize ourselves for what we really are: small and poor sinners” – but always Mary’s children. The Pope’s visit to the memorial column dedicated to the Immaculate Conception, included the traditional blessing of a garland of flowers which Roman firemen placed on the statue of Our Lady which dominates the summit of the ancient marble column. Vatican City, Dec 8, 2017 / 10:40 am (CNA/EWTN News).- In a video series for Italian television network TV2000, Pope Francis said that “lead us not into temptation” is a poorly translated line of the Our Father. A European financial watchdog has praised the Vatican for freezing suspicious transactions but stressed the Holy See must do more to prosecute those accused of laundering money. But they noted that that while “considerable amounts of money” have been frozen not a single money laundering case had been brought to court nor had potentially laundered funds been confiscated.